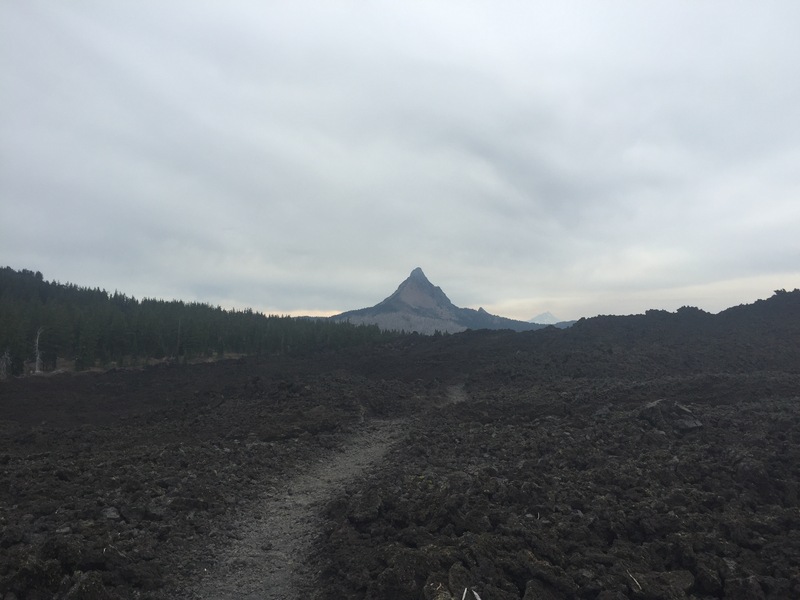 Day 116 we headed down towards more lava fields, and walked on rough, loose lava rock for nearly 5 miles. It was tough going, but we finally made it to firm ground and into Big Lake Youth Camp. 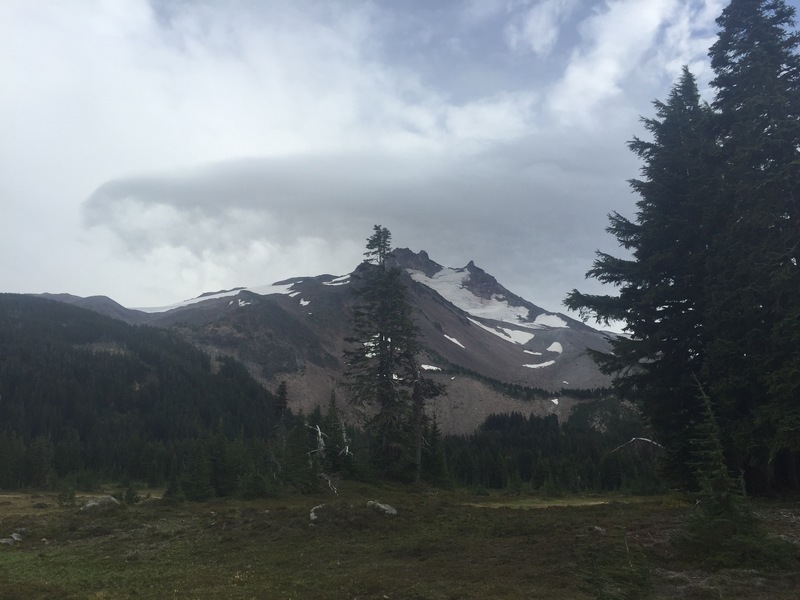 The camp is very hiker friendly, and offers free showers, laundry, and meals to thru-hikers. 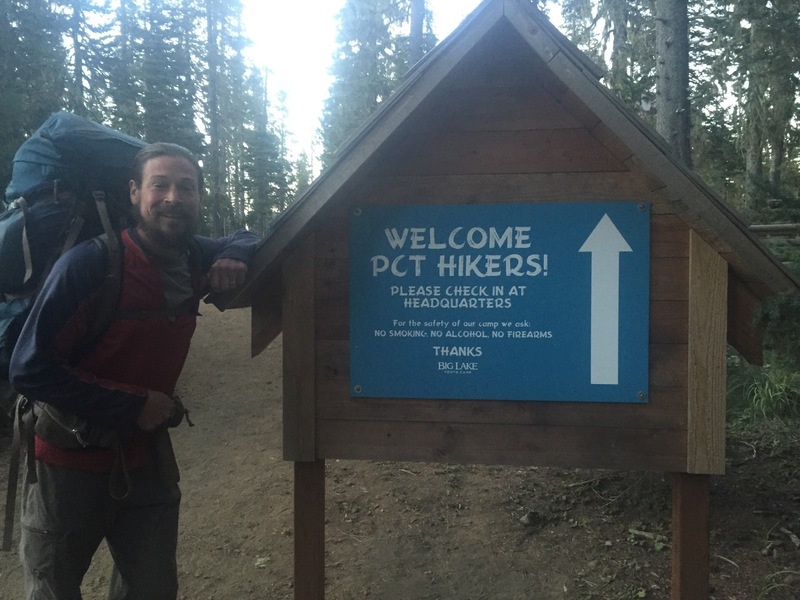 They are even building an A-frame cabin to host thru-hikers next year! We took advantage of the laundry and showers, and then enjoyed a buffet vegetarian dinner with fresh vegetables, cheese, and dinner rolls (hikers love buffets!). We also picked-up another food drop, and got a package from Garrett’s mom. We were excited to find candy corn, and a box of chocolates, amongst other yummy treats. The fuel was received just in time, and was a nice change from our usual energy/granola bars. 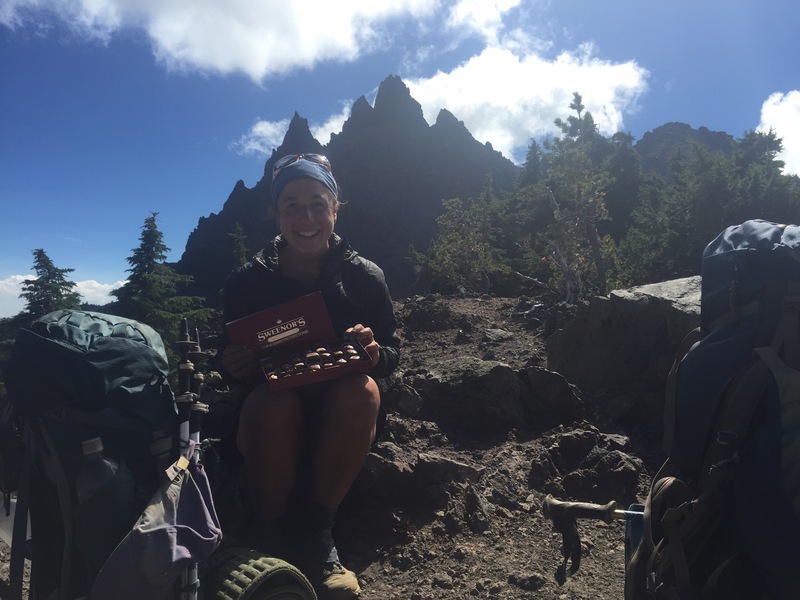 The chocolates powered us up to the ridge and past the 2,000 mile mark the next day. 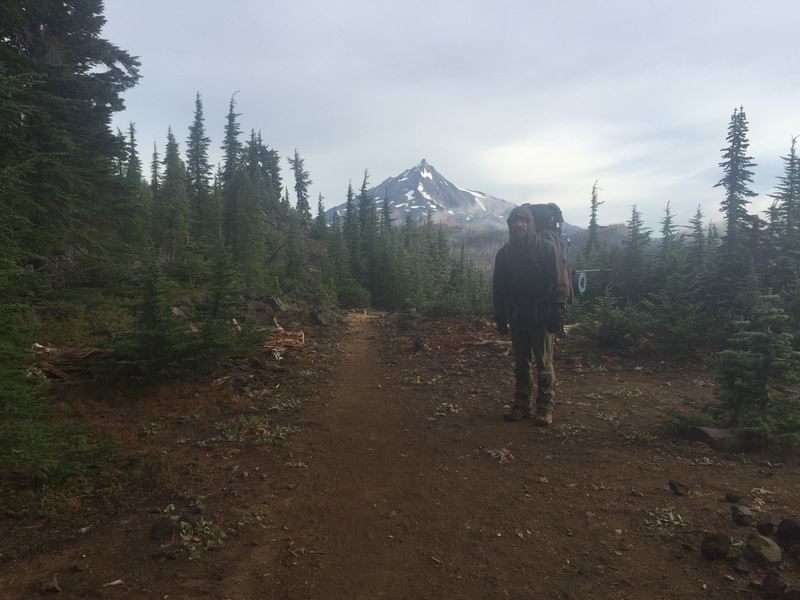 We didn’t see many hikers, and spent a quiet afternoon heading closer to Mt. Jefferson. nothing like a box of chocolates to get you up a mountain! It became quite windy and cold towards the end of the day, so we erred on the side of caution and set-up camp in a sheltered spot a bit earlier than usual. That night it rained, and we awoke in a cloud. 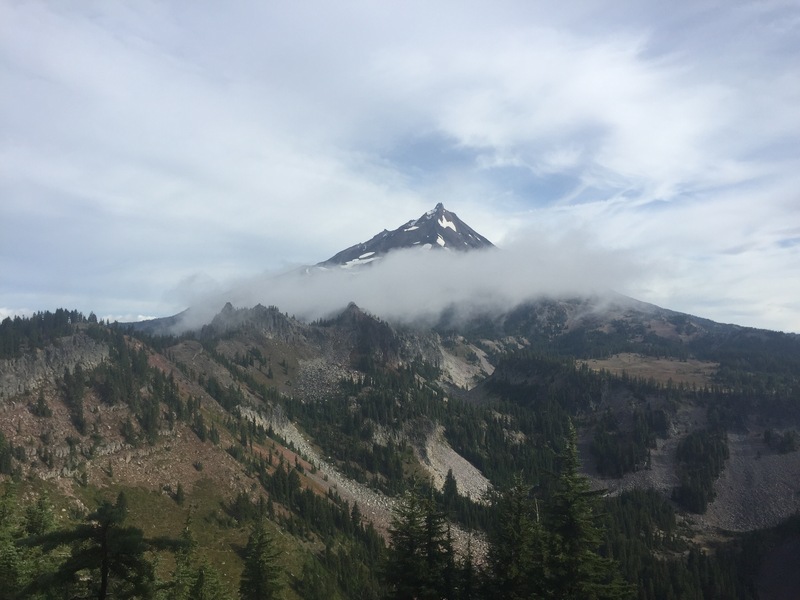 The day was raw, but beautiful, and despite the clouds we managed to get some good views of Mt. Jefferson. Towards the evening the sky started to look threatening again, and we set-up the tent just before it started to rain. We decided to eat dinner in the tent to stay dry, which we never do- but it was nice to be cozy in my sleeping bag while eating cold rice! It rained into the morning, and Garrett let me sleep-in again because he didn’t want to get out of the tent. When I did awaken, we ate in the tent again to stay dry for as long as possible. When we were done, the rain had mostly stopped, but it was in the low 40s and windy- so we hustled to pack-up and get out. We stayed in the mist for most of the morning, and it started to clear around noon when we arrived at the Ollalie Lake Store. The store sits practically on the trail, so it is a popular spot for hikers. We spread out our wet tent and packs at the picnic ground near-by to let everything dry out. While it did we picked-up some more supplies (we found orange soda pop-tarts! ), and ate lunch. It was a plesant stop, and we were there until about 3pm before taking off for some more miles. We made it 9 more miles to Trooper Spring, and just before we made it to camp it started to rain. We got our rain gear on and sat under a tree eating dinner, hoping the rain would stop. It didn’t, but it eased-up enough for us to find a dry spot under another tree. We got into the tent, and hoped for sun the next day. Think of you both often! Miss you at the restaurant here in Harpswell!